Both of these Mountain Men are trying to _”keep their powder dry”_ as their loaded canoe capsizes in some white water rapids, only to find themselves disturbing a major grizzly’s fishing. Makes one wonder just what these brave souls went through in their daily experiences in the wilderness. 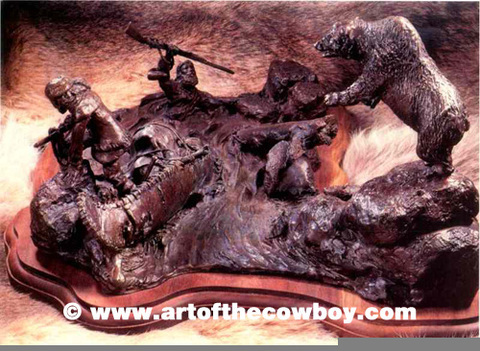 There is plenty of detail to explore in this action filled bronze sculpture.